Are you in search of a construction architecture job in Illinois or is your company looking to hire an executive-level construction architect? If you answered yes to either question, then look no further! Our expert architect recruiters will find the best match for you! They understand that the job of a construction architect is not only design and construction of buildings – it also requires expertise in business and management. The construction industry employs more people than any other industry in the US. All construction work needs planning and design which is done by construction architects, most of who are in building construction and heavy and civil engineering subsectors. Research and discovery – we learn about you, your company and how to work together. Development of a recruitment plan – we identify the best candidates from our industry connections. Targeted recruiting – we look beyond a resume and look for career goals. Candidate evaluation – we provide you with a short list of the best candidates. Process management – we manage the process throughout. Reference checking – we perform reference checks on the final candidates. Presenting the offer – we present the offer the right way. Acceptance of the offer – we stay in close contact to make a smooth transition. 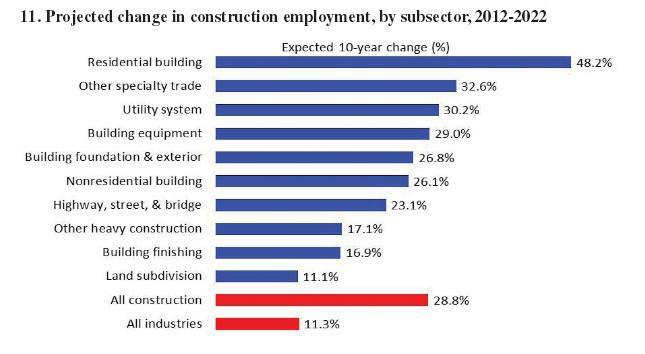 By the end of 2014, the 3 major construction subsectors given below showed continuous improvement in employment, though the numbers were still way below their 2007 level. Most construction jobs pay well in the United States. Average wages tend to be especially high in heavily industrial and business areas with dense populations, like Chicago, Los Angeles and New York City. Although there was a dip in wages between 2007-2009, we are now seeing a fair recovery and we are beginning to grow again in all 3 subsectors (chart). If you need placement assistance in the construction industry, call Construction Hunters today. Contact our recruiters today about filling your construction architecture job in Illinois @ 214-935-3626.